Are you embarrassed by missing teeth? Looking for a permanent, natural alternative to dentures? Dr. Nicholas G. Zeik, in Marlboro, New Jersey, specializes in dental implants, which offer you the best, most stable and longest-lasting solution for replacing missing teeth or dentures. Thanks to advanced technology, today's dental implants look, feel and function like natural teeth, making it easy for you to eat, speak and smile with confidence again. In fact, dental implants are so comfortable and natural-looking; you may forget you ever lost a tooth! 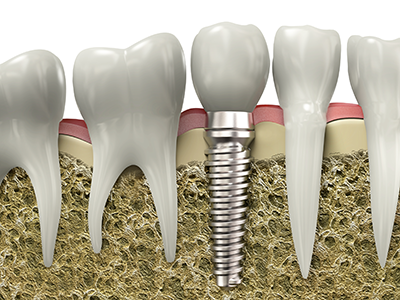 Dental implants are specially-made titanium anchors that are placed into the jawbone where teeth are missing. Once the bone bonds with the titanium, a post is inserted into the anchor and an artificial tooth (crown) is attached to the post. If you have healthy gums and bone, you might be a candidate for dental implants. Dr. Zeik can restore your smile with implants often in as little as one or two office visits. Implants can change not only your smile, but your entire life as well. Many patients discover that dental implants restore their self-esteem and improve their quality of life. Best of all, implants last a lifetime and require no special care other than brushing and flossing. If you have missing teeth and want to smile, speak and eat again with comfort and confidence, call our office at 732-863-8040 to schedule an appointment. You can also use our online form to request your complimentary consultation. Need financial assistance? We offer in-house financing and other solutions for dental implant restorations.